Enter this giveaway for a chance to win a bookish Etsy gift worth $20 and books of choice worth $25. The Etsy gift will be a surprise, but we'll ask the winner for a list of likes and dislikes. Good luck! I love bookish coffee mugs and cushions, perfect accessories while curled up on the couch reading. My favourite is a bookmark. I love how cute and quirky some of them are. There's nothing worse than becoming totally enraptured in a book, and then losing your page. A bookmark will save you all that stress, and there are some interesting ones out there. I love a bag printed from a beautiful bookish memory. Smile-worthy every time. "What's your favorite bookish accessory and why?" One of those tea-filtering egg thingies for loose tea. It makes the use of loose tea so much more convenient for an afternoon of reading and tea-drinking! My glasses are my essential accessory! Mine would be pretty bookmarks! �� since I don't like doing dogears on my books' pages. 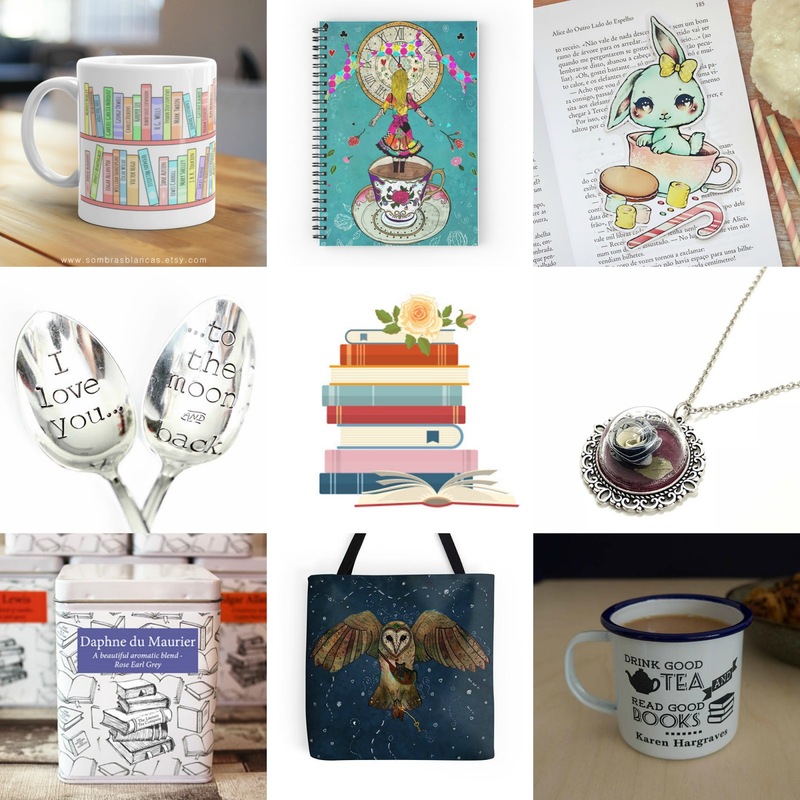 I love anything book-related -- mugs, bookmarks, bags, etc. Coffee mugs because I love to read and drink coffee. Right now my favorite item is a mug I got from Owl crate! I'm leaning towards tote bags. It's fun when someone asks me about the book. My favorite bookish accessory is mugs because I always make a cup of tea when I read. I love bookish tote bags, because they are great for carrying my library books. I like coffee mugs and tote bags. A candle to remind you of the library. I love bookish tote bags. I love book bags too. Very useful and lots of fun. My favourite and necessary bookish accessory is a good quality book mark. I absolutely love the Boookish "I love you to the Moon and Back" spoons. I say this to my daughter and grandchildren, my mum says it to me. It is a special saying in our family. Probably bookends, they can be pretty and useful. Book tote-bags and bookmarks definitely! Oh Oh! And candles, very recent introduction Lol! I love bookmarks cause I HATE dog earring my pages and the candles cause it's all about the mood right? :p Plus I love the thought of certain scents reminding me of my fav characters. And totebags cause they're bookish totebags. Bookmarks, most of the time they're pretty, and they're always useful. A good bookmark because it's useful. I love a good mug for sipping coffee or tea while I read! I have a Kindle cover that looks like a "real" book. I have some bookish pillows that I just love and also a couple of bookish mugs which are also really awesome because I drink a lot of tea and it makes for good photos. I love journals & notebooks. I like to jot down my thoughts. I like my book light, so I can read a paper book after going to bed and not disturb my husband. I love tote bags! Practical and show my love of reading. I love the cushions they make my house look more homely. I have recieved some lovely bookmarks from family and friends which i love. My favorite accessory is a bookmark because it keeps your place and that's an important thing to have. I have a lovely feather bookmark that was giving to me as gift. Love it as it has a sentimental value. I love mugs and totes! I love the mug bacause I love a warm drink when I am reading and I love mugs too. I like mugs because I like a great cup of coffee. I love drinking out of bookish mugs and carrying bookish tote bags when I go shopping. I like bookmarks. They mark the stopping place while you are reading and they look nice. I have several book themed or pop culture themed bookmarks. I love bookish mugs because they are unique and can be used everyday. Love the mugs and the tote bags. Especially the ones which have literary puns on them. You can use them everyday and if you take the mug to work (heaven forbid someone drops it) they brighten up your day. I love my bookmarks and a little bag to take them with me to my front yard to read. love it. I love jewelry, bags, t-shirt and scarf (tote, wallet), because i could wear it everywhere easily and i like fashion too.